Creamy or firm when cooked, yams have an earthy, hardy taste. It is a hearty tuber usually with a minimal amount of sweetness. There are approximately 200 different varieties of yams with flesh colors varying from white to ivory to yellow to purple while their thick skin comes in white, pink or brownish-black. The shape of the yam can be oblong, tapered or round with a thick outer skin that is dark brown and bark-like, ranging from smooth to shaggy in appearance. Their dense flesh can be an off-white color to pale yellow or slightly pinkish orange with a very starchy texture. The glycemic index of yam is 51 which is at the higher end of the low GI range and the glycemic load of approximately ¾th cup of chopped raw yam is 9.3 which is also low GL category. Is Yam safe for Diabetics? The glycemic index of yam is 51 and the glycemic load of ¾th cup of chopped raw yam is 9.3. Yam is a starchy vegetable provides around 18.4g of simple carbohydrates. Simple carbohydrates gets easily absorbed into the bloodstream and tend to fluctuate your blood sugar levels. Thus even though it is low in glycemic load, it is advisable to include only ½ cup of chopped yam occasionally in your diet because of its high carbohydrate content. Remember, moderation is the key. Control your portion size. Combine your yam with any other low GI-low carb food so that the overall glycemic load of the recipe is reduced. Is Yam suitable for Weight Loss? ¾th cup of chopped raw yam provides around 80 calories. Also it has very less amount of fiber. Fiber plays an important role in making you feel satiated for a longer period of time. 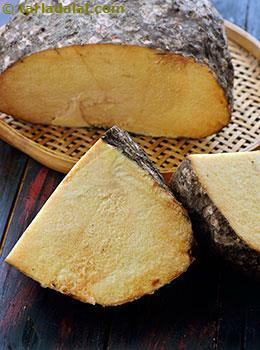 With negligible amount of fiber and high calories, yam is not advisable for the weight watchers. In fact due to its high amount of simple carbohydrate content, it easily gets converted into fats. Thus accumulation of fats adds on to the weight gain. Try replacing simple carbohydrate rich food by complex carbs which is also high in fiber.